In her first year as a missionary to a small group of native women in the Ecuadorian jungle, Elisabeth Elliot faced physical and spiritual trials. 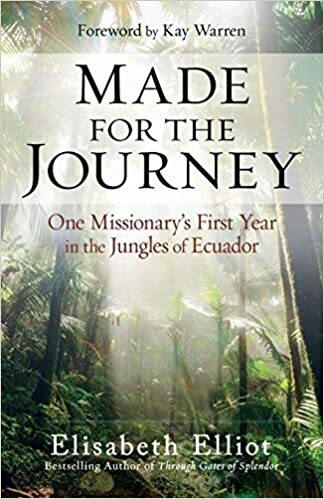 In Made for the Journey, Elliot captures the mysteries and stark realities surrounding the colorful and primitive world in which she ministered. More than just a recounting of her early days, this is a beautifully crafted and deeply personal reflection on the important questions of life and a remarkable testimony to authentic Christian obedience to God. Elisabeth Elliot (1926-2015) was one of the most perceptive and popular Christian writers of the last century. The author of more than twenty books, including Passion and Purity and The Journals of Jim Elliot, Elliot offered guidance and encouragement to millions of readers worldwide. This book was so impressive. Honestly, I had heard and read about Elisabeth Elliot and Jim Elliot and the story of his death when they were ministering to the Indians, but I had never heard about her life before she married Jim. I really enjoyed reading this book. It is fairly short, an easy read, convicting, and inspiring. I enjoyed reading the jungle stories about how people lived and their ministry. Growing up on the mission field myself, made the experience more real. The stories of the jungle people and their experience there really came to life for me. I also learned alot about how a language, without a written alphabet, is learned and put to paper. I found that to be very interesting. I especially enjoyed reading about her thoughts, how she felt, what she expected - her joys and disappointments; and principally her relationship with God. So many times we expect God to 'come through' for us, when we feel like we are doing what He called us to do, and then get disillusioned when our expectations are not met. This book was a really thought provoking and a great encouragement to me. I was blessed with a copy of this book by Revell. I was not asked to review it positively and all opinions are my own. I love hearing from my readers. Thank you for leaving a comment. Reading is one of my favorite pastimes. This blog allows me the amazing opportunity to receive free books, get to know the authors, and share my thoughts on the books I read. It also give me the privilege of getting to know my readers. Please feel free to comment, ask questions, and share your opinions. Connecting is a joy. If you are an author, feel free to contact me via the contact page if you have a book you might like me to review. PLEASE!!! Leave an email or way to contact you if you enter the giveaways. I have had several people selected as winners, but with no way to contact, I have had to select a different winner.